The test machine is relatively small (1.75m long by 1m wide) and is manoeuvered into position manually as it has no motor. It has 4 wheels, a disc braking system and hydraulic suspension. Once in position the rear hydraulic suspension is lowered so that the machine is firmly in contact with the ground and is immoveable. Two manually operated hydraulic pistons are used to apply the test load to the lighting column. A pressure gauge measures the amount of force applied by each piston. A sling is passed around the column and secured to the lower piston which is then used to pull the sling in tight so that the test machine is firmly fastened to the base of the column. This prevents excessive movement of its foundations. The upper piston (whose height can be varied) has a padded ram attached which is used to apply the test load to the column. 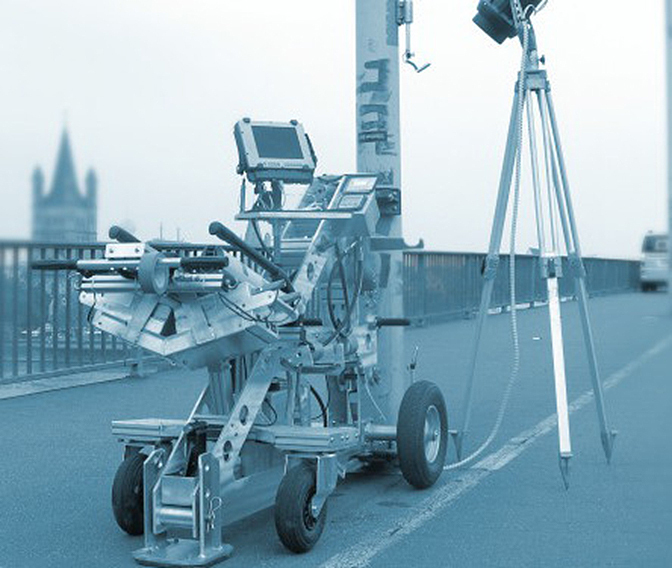 The response of the column to the test load is measured via a system that uses lasers mounted on the column (one near the base and the other at 2 metres) and a specialised 3D camera connected to a laptop that runs bespoke structural analysis software which records the movement of the lasers. For analysis purposes these recordings can be replayed in slow motion or real time. The laser movement is also plotted on a graph whose characteristic profile indicates any failures in the column’s structure. The test machine also has a flashing amber beacon which is visible throughout 3600 for safety when working at night or during poor visibility.